WARNING: This review will contain MAJOR SPOILERS FOR BOOK 1, RED QUEEN. Do not continue if you have not yet read Red Queen. Seriously: Red Queen has one of the best plot twists ever and you do not want to be spoiled for it! 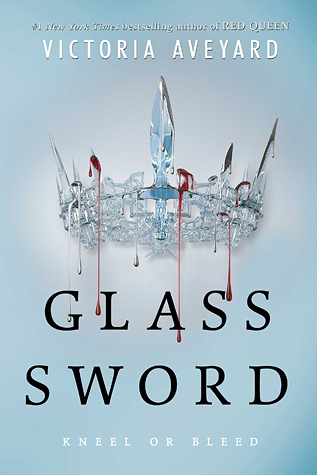 Review is spoiler-free for Glass Sword though. The second part in the Red Queen series immediately reminded me why I loved the first book. This one starts of right after the end of Red Queen and so you are immediately thrust back into the story and into the action. The story is action-packed, an addictive read that is full of twists and turns. And that ending! Victoria Aveyard is the master of explosive endings that will have your head spinning and will make the wait for the next book almost unbearable. I also really like what she did with the character of Mare. It was clear in this book that she is haunted by what she has done and by what has happened to her. (It actually did give me some Katniss/Mockingjay vibes) It’s hard to read, but it’s realistic and I applaud Victoria for having the guts to make it as dark as she did. Mare is not the same girl as in the beginning of Red Queen and she has some major anxiety and trust issues. But she is strong and keeps going, trying to find and save as many newbloods as possible and becoming a leader in the progress. Cal is another great character. Like Mare, his whole life has been turned upside down. He has been hurt and betrayed and exiled by his people. I loved how he handled everything and as with Mare, I really appreciated that not everything was so easily fixable. He’s a good guy, but it’s never sure where his allegiances lie and that makes it hard for both Mare and the reader to fully trust him. We also get to know some of our favorite secondary characters a lot better, like Farley, Shade and Kilorn. And a lot of new characters are introduced and I quickly loved them all. I loved their powers, their interactions and their missions. I’m quite intrigued by Ada’s ability – I think it’s the one I would like to have the most to use in my own world. We have more interactions between Kilorn and Cal, Shade and Farley, and so many more of the new characters and it was just great, even though you are constantly reminded that anyone can betray anyone. Maven is not around a lot, though he is a constant presence in our character’s minds. I’m honestly still a bit in denial about him – I just can’t fully believe he is completely evil. I am still hoping for a redemption arc, even though it seems rather unlikely at the moment. Though I really loved this book, it did have a few flaws. One was the pacing. Something just felt a bit off for me. There were some parts that were quite slow and very descriptive and other parts where it was like you blinked and you missed a whole part. There were a few scenes where I actually turned back the pages thinking ‘wait I think I skipped a few pages’, but it was just the pacing. Another was that there was a death coming that was quite predictable. It was like watching a horror movie: some criteria were just met so you knew that this person’s death was practically guaranteed. Even though I really wished I was wrong because I grew quite attached to this character, it still happened exactly as I had predicted. Overall I really loved this book, just slightly less than Red Queen. But that ending! It will be hard to wait another year to find out what happens next.